All objects have what we call, internal energy in its molecules. 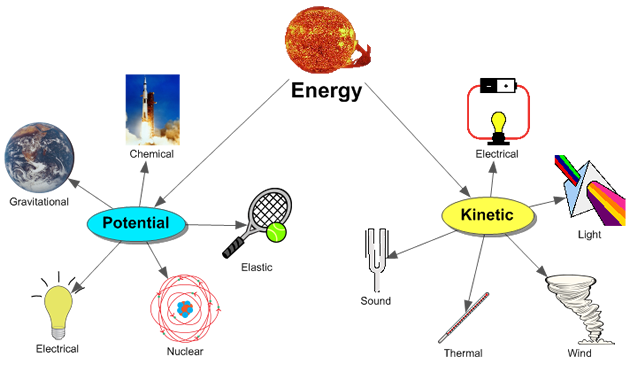 Internal energy is made out of Kinetic Energy (due to the motion of the molecules), and Potential Energy (due to the position of the object). You can’t create or destroy energy, energy is conserved. However, energy can be transferred and stored. 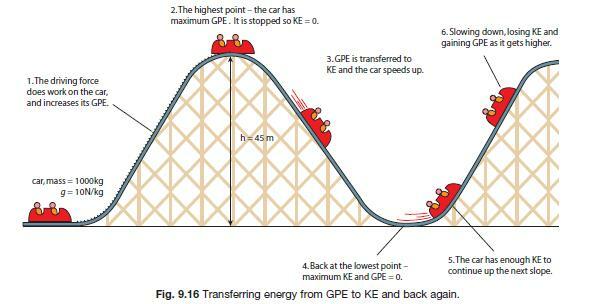 For example, when you jump of a cliff (god forbid), the Potential Energy will slowly be converted to Kinetic Energy. The NET Energy remains the same, but you see a transfer of energy from one form to another. Conservation of energy principle: energy cannot be created or destroyed, when work is done, energy is changed from one form to another. The most everyday example of this is when we move, our cells turn chemical energy (in glucose bonds) into thermal and kinetic energy. Estimate the value of v from the ticker-tape. 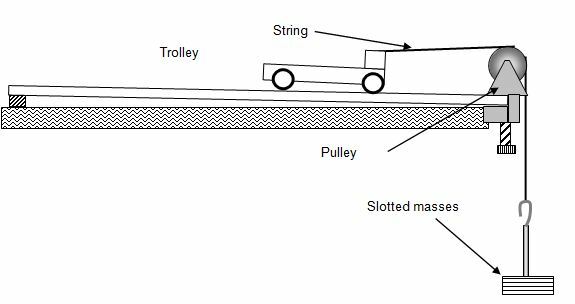 Measure the mass of the trolley on the balance. transferred by the falling load, E = mgh. This means that 10% of the electrical energy supplied is transferred as light energy (90% is transferred as heat energy). Renewable sources of energy, just like it sounds, are resources that theoretically can be used for ever if used at a rate which is consistent with the rate in which it is replenished. Examples include solar, wind and water energy. Every day, the sun comes out and we can indefinitely use its energy—for the time being at least. Non-Renewable sources of energy are resources that get exhausted when used, and basically when you use all of them, that’s it, they’re gone. Examples include fossil fuels, oil and coal. Burn the chemical fuel to produce heat. The heat is then used to heat a liquid such as water which is then turned into steam. The turbines are mounted on a gearbox shaft, which generated electricity. 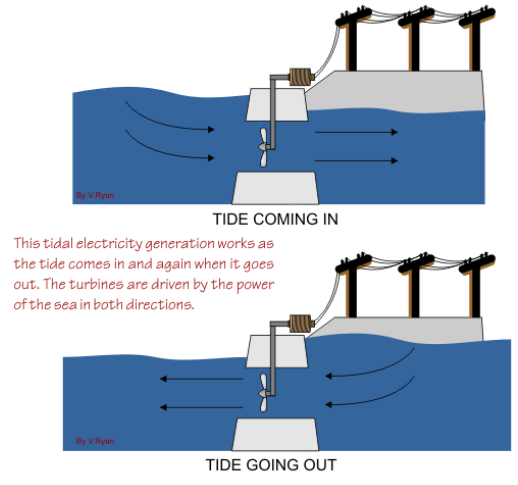 Underwater cables then help carry the electricity to the shore. Initial costs of building dams are extremely high. Affects transportation system in the water. Affect ecosystem surrounding the dam. Possible to use the natural heat of the earth to generate electricity. Cold water is first pumped underground. The cold water then comes out as steam. 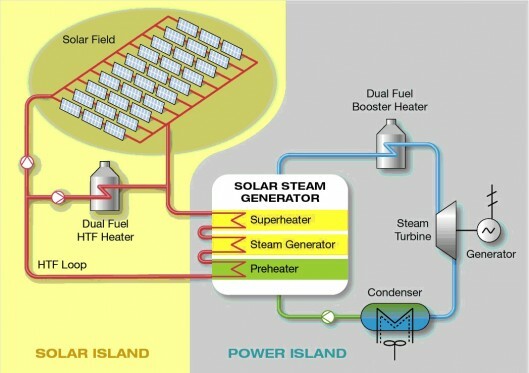 This steam can be used for heating or powering turbines to create electricity. Potentially unlimited supply of energy. Little impact on the environment. Only works in area with volcano activity. There may be little volcanic activity, making power stations unnecessary. Electricity can be generated through nuclear fission. During nuclear fission, energy is released, and electricity can be produced in the Nuclear Reactors. Heat from the sun is trapped in solar panels and subsequently converted into electricity. May be costly to install solar panels. 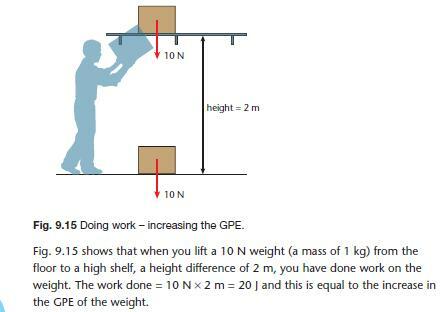 How much work is done when a man pushes a box with 10N of force across the floor 2m away? Power is the rate at which work is done. It is the work/time ratio.The standard metric unit of power is the Watt (W). 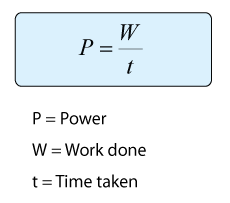 As is implied by the equation for power, a unit of power is equivalent to a unit of work divided by a unit of time. Thus, a Watt is equivalent to a Joule/second (J/s). Fig. 1- When this woman runs upstairs starting from rest, she converts the chemical energy originally from food into kinetic energy and gravitational potential energy. Her power output depends on how fast she does this.